Sant Joan – Welcome summer! Sant Joan in Barcelona – Welcome summer! Sant Joan is a very special and magical night in Barcelona.It is held on June 23rd, which is the shortest night of the year, and it is to welcome the summer. Sant Joan is a very special and magical night in Barcelona. It is held on June 23rd, which is the shortest night of the year, and it is to welcome the summer. The streets are filled with parties, dances, outdoor dinners, bonfires, fireworks and many firecrackers. 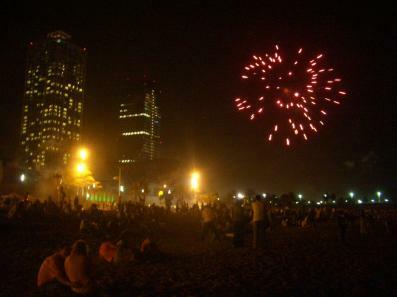 The city's beaches are some of the most popular sites to celebrate and they offer a good view of the fireworks that light up the night. Hotel Paseo de Gracia would like to recommend caution with fire, firecrackers, and all excesses, so that this wonderful night can become a good memory. Happy Sant Joan!